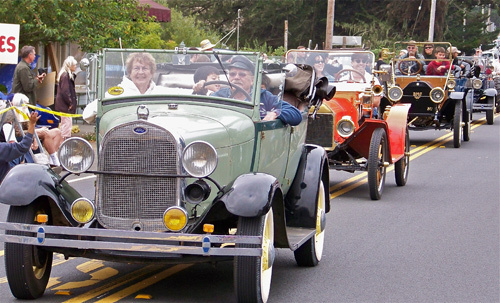 Tomales held its annual Founders Day parade and picnic Sunday. Steve Rosenthal, superintendent of the Shoreline School District and principal of Tomales High, was honored as parade marshal. 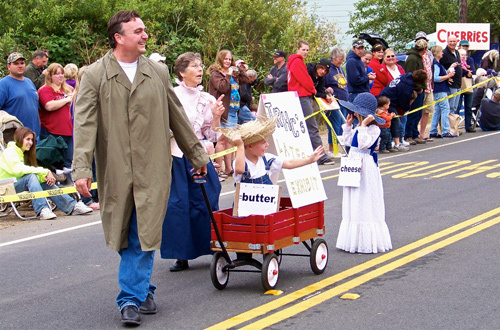 Bert Crews and Dru Fallon O’Neill, both of Tomales, were the parade announcers. 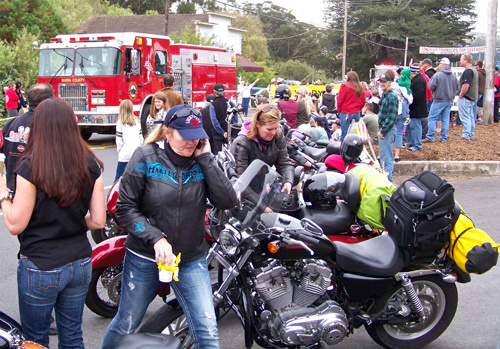 Seen here passing a lineup of motorcycles at the main intersection in Tomales, a noisy caravan of fire engines led the parade, their sirens drowning out this cell-phone call. 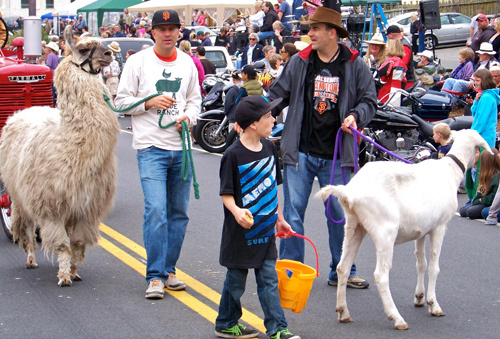 Slide Ranch, which is located between Stinson Beach and Muir Beach, provided a contingent of two goats and a llama. 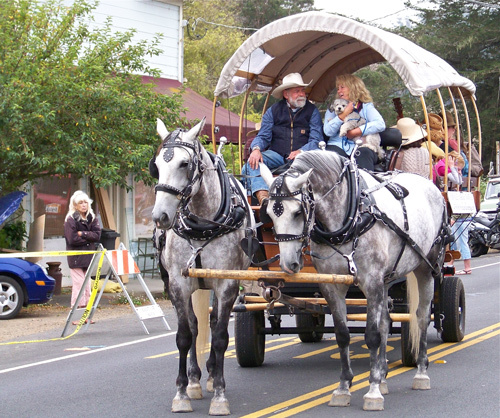 Indian Valley Carriage from Novato carried a jug band. At the very back sat Ingrid Noyes of Marshall playing an accordion and kazoo. The Sanchez family in a 1950 McCormick Farmall. Three generations of the family took part in the parade. Maryann Diaz-Romero, vice president of the board of the Tomales Regional History Center, wearing a pink blouse from its collection, with the Martinelli family and a wagon that promoted the historic dairying exhibit currently at the center. Antique cars driven by the Traversi and Simoni families, with three generations from each family, were among the highlights of the parade. From front: Myrna and Al Traversi with their grandchildren Matthew and Jacob in a 1928 Model A Ford, Steve and Michelle Traversi in a 1913 Model T, Wayne and Kimberly Simoni in a 1912 Studebaker EMF, and Troy and Mary Ellen Simoni in a 1931 Ford Model A roadster pickup. 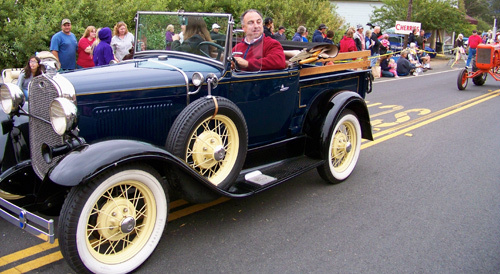 Among those riding in the line of antique cars were a family of five who showed up from Dubai. Troy and Mary Ellen Simoni have lived in the United Arab Emirates for the past year and were home on vacation with their children — Olivia, 12, Nathan, 10, and Sophia, “nearly 8.” The children rode with their grandparents, Wayne and Kimberly Simoni of Sebastopol. The Tomales High cheerleaders drew heavy applause from bystanders. 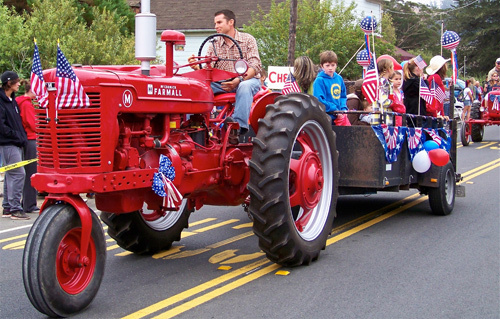 Anna Erickson, a 5th generation member of a local ranching family, drove the Hands Full Farm float. The farm is in the Valley Ford area. 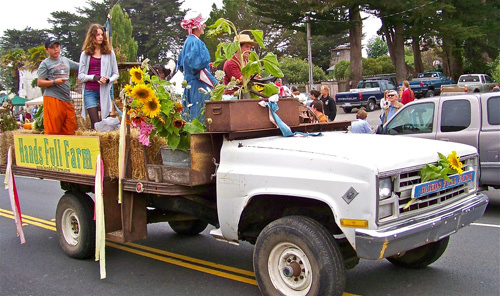 The Ancient and Honorable Order of E Clampus Vitus, a fraternal organization dedicated to the study and preservation of Western heritage, has memorialized events in Tomales history. As the organization, which is known for pranks, paraded up Highway 1, a Clamper broke away from the group. To bystanders’ amazement, he grabbed a spectator, whose name is Debbie, and gave her a passionate kiss on the lips. When she laughed, so did everyone else. It turned out that the Clamper, Kevin Dixon of Vallejo, is married to Debbie. The kiss, he told me later, was a spur-of-the-moment idea. 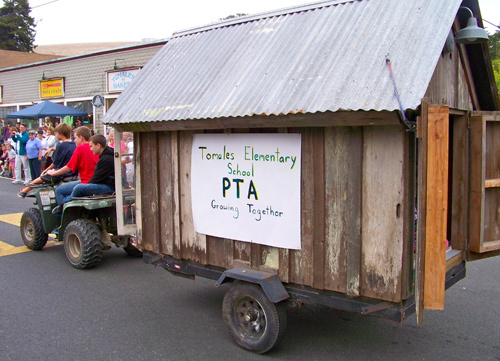 An All Terrain Vehicle (ATV) driven by young people pulled the Tomales Elementary School PTA’s float. 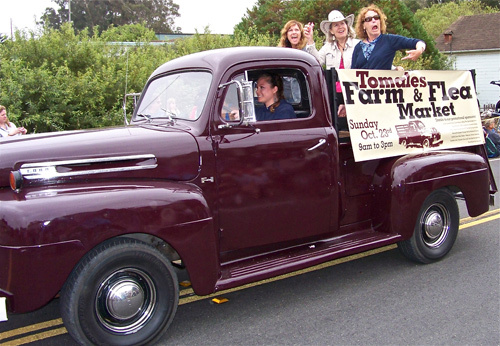 Marissa Thornton of Tomales drove a float promoting the Tomales Farm and Flea Market, which will be held from 9 a.m. to 3 p.m. Oct. 23. 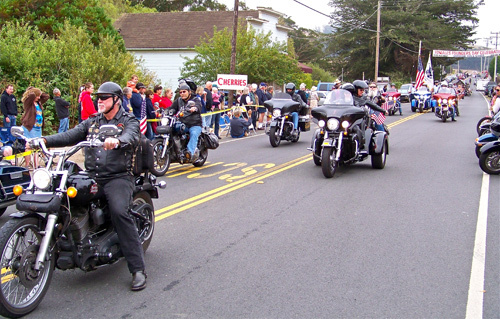 Redwood Empire Harley Owners. The parade contingent said their 300-member group has collected $1 million for the California Council on Aging’s “meals on wheels” program. 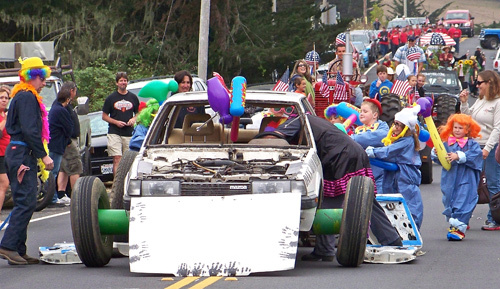 Dan Norwood of Dan’s Auto Repair in Tomales drove a wobbly car that kept coming apart only to be reassembled by clown mechanics. 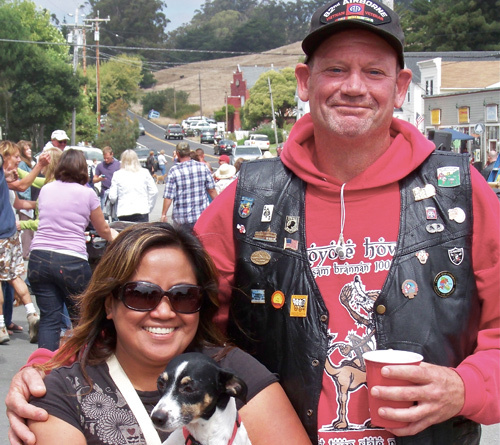 DT Motor Sports of Bodega Bay with Miss Bodega Red, Tia Minto, 11. 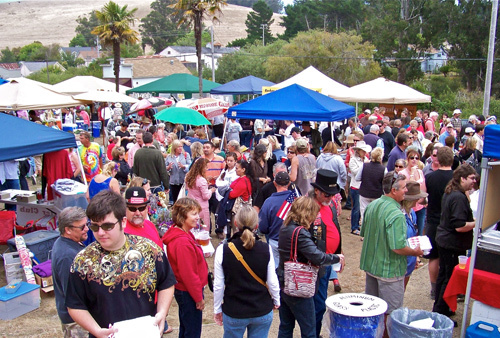 The crowd picnicking in Tomales Park enjoyed a variety of fare, as well as beer and wine. Crafts and used books were also on sale. Madam Zublatsky (Roberta Vinck, a marriage and family therapist in Tomales) read palms, with all proceeds going to the park. 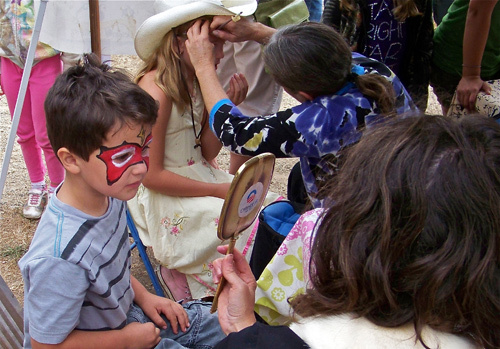 The Tomales Elementary School PTA raised funds with face painting. Sparsely Sage and Timely is powered by	WordPress 4.9.10 and delivered to you in 0.885 seconds using 56 queries.